The Cleveland Cavaliers got out of dark times when LeBron James came back from an injury, starting a winning streak against the Los Angeles Clippers. The run of wins continues and extends to 12 with a 105-94 victory against the same team everything started against, more busy arguing with female officials than trying to stop an embarrassing collapse. James dunked and dunked and dunked in the first half, finishing with 23 points and 9 assists while Kevin Love, finally escaping his shooting funk to lead the team with 24 points and 9 rebounds, while J.R. Smith helped with 16 points. The Cavaliers played at the highest gear and speed possible until the Clippers were nothing more than a speck on the rear-view mirror, in one of the easiest and most impressive (stylistically at least) win of their undefeated run. How easy was it? The Cavaliers at out their starters in the final quarter, were outscored by 20 points and still won the game by 11 points. Doc Rivers apologized to a Clippers fan during the game, saying his team will make it up to him later. It’s not quite clear if the fan is from Cleveland, because if that’s the case, he’ll have to wait until next season to see his favorite team trying to make up for an embarrassing performance. Why was it embarrassing? Because the Clippers held up their arms up in despair very early in the game. The defense was atrocious, the hustle back to defense was appalling and it was quite clear that after the 65 points the Cavaliers put on them in the first half, there wasn’t going to be some massive comeback to change the fortunes of this game. You have to take in some bad losses in a long NBA season, but giving up on a game so early is never a good sign for a group trying to win a championship. There were the technical fouls (five of them called on the Clippers) which will probably be debated in the coming days because of Chris Paul making comments about the quality of refereeing, directing his comments at Lauren Holtkamp, who just happens to be a women referee in a male sport, which is always a great way to create a debate that is going to be taken into all the wrong places by the parties with different interests in mind. 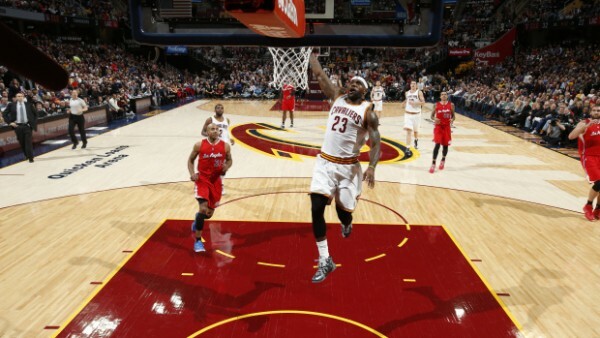 But above all else it’s the Cavaliers and their winning streak, now up to 12 games. It’s about a team that looked disjointed a month ago, uninterested in playing like a team on defense or making an effort to coordinate their talents on offense. Winning and hope changes everything. The right trades help too, as Timofey Mozgov gives this team a very reasonable option in the paint and presence defensively, while J.R. Smith finally gives this team the shooting guard it’s been looking for, not forced to play with an unbalanced lineup that includes Shawn Marion and only one guard. The best team in the NBA? That distinction still belongs to the Golden State Warriors, ranked number one in both offensive and defensive efficiency along with the standings, but the Cavaliers might be playing the best basketball in the league right now, with the Atlanta Hawks finding their way back from their own winning streak ending. A big difference between those teams and the Cavaliers? James, still the best player in the NBA and undoubtedly the leading candidate to win the MVP at the moment.